This post contains affiliate links. I only link to products I use and/or love. See my disclosure for more information. Smoothie recipe is hands down one of the most requested posts from me. Every time I Insta-Story a picture of the smoothie I devour I get at least a few DM’s from the readers asking me, ‘what do you put in your smoothie’? Smoothies are a nutritional powerhouse, period. But only when they are made with the right balance of ingredients! 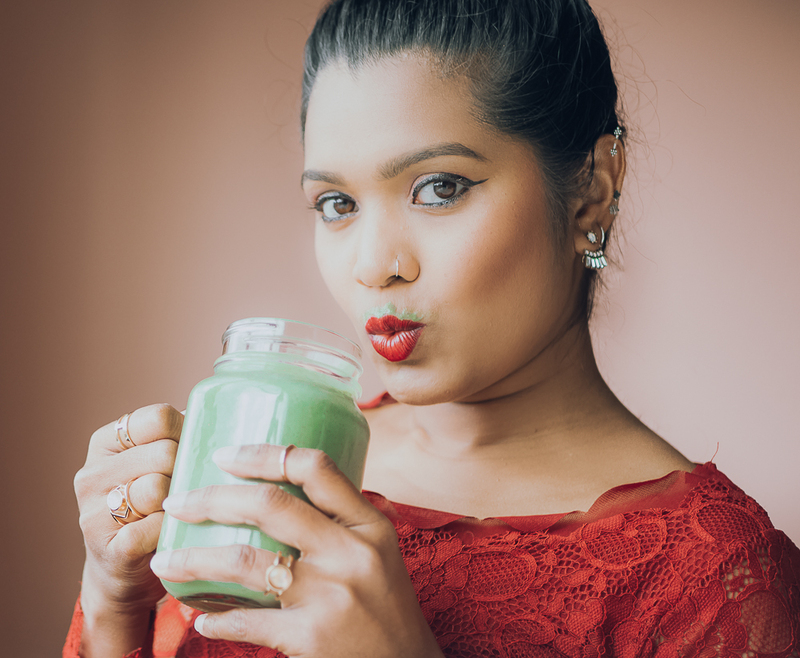 With a combination of fruits, vegetables and other superfoods thrown in, smoothies are one of the healthiest, quickest and most delicious drinks you can ever make, and drink! And it is also the easiest way to pack a lot of nutrients into just one drink. Smoothies are usually a morning routine in our household. I got into the habit of making smoothies back in 2013 (when we were still in NY/NJ), I think long before it was such a BIG fad (or was it? ), and long before I joined Instagram ;). I slowly started by looking up recipes on Pinterest and trying different combinations and as I started to get a hang of it, I eventually started making my own variations. Back then, I would make a huge grocery list of all the ingredients, shop, prep and freeze chopped ingredients in individual ziplock bags over the weekend for my morning smoothie for the rest of the week (because spending plenty of time in the kitchen during weekday mornings was not an option). But I soon realized (rather reconfirmed) that I do not like smoothies made out of frozen ingredients, at which point I would thaw them in the refrigerator overnight and use them in the morning. But that didn’t please my taste buds either. So, fresh ingredients chopped the morning of is my way to go. And now that I have got a hang of it, I only spend about 15 mins in the mornings to make smoothie + breakfast + pack lunch. To some, the number of ingredients (16 or more, yup, no kidding) that go into my smoothie might sound outright ridiculous, but it’s the only way I can make sure we supply our bodies with the much-needed nutrients (by we I mean, the hubs, myself and when parents are here, them too. And yeah, my parents love smoothies too - now they too make it every day back home in India, I couldn’t be more proud!). 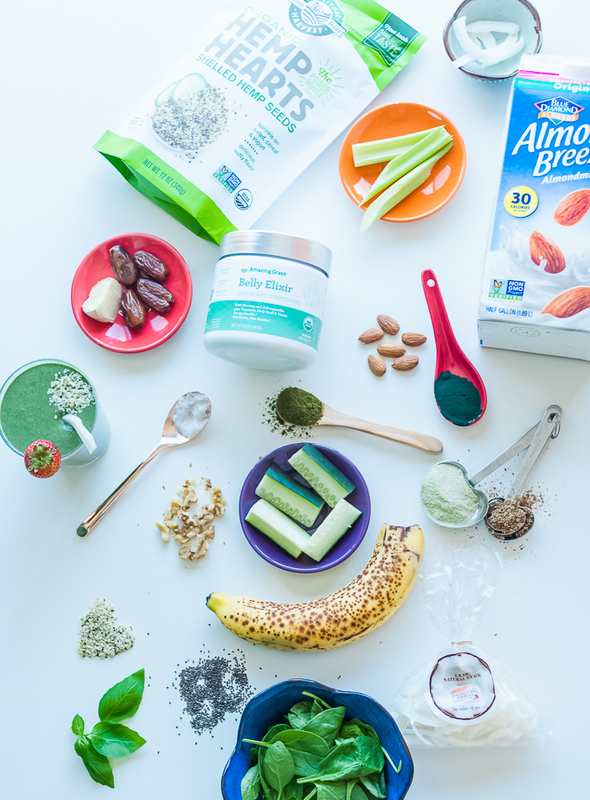 Every time I come across a new superfood, I get super excited (no pun intended) about trying it, and not just try it, but I also make sure to add some (in a reasonable amount) to my smoothie and test it out. And hence the growing number of ingredients in my smoothies hehe. 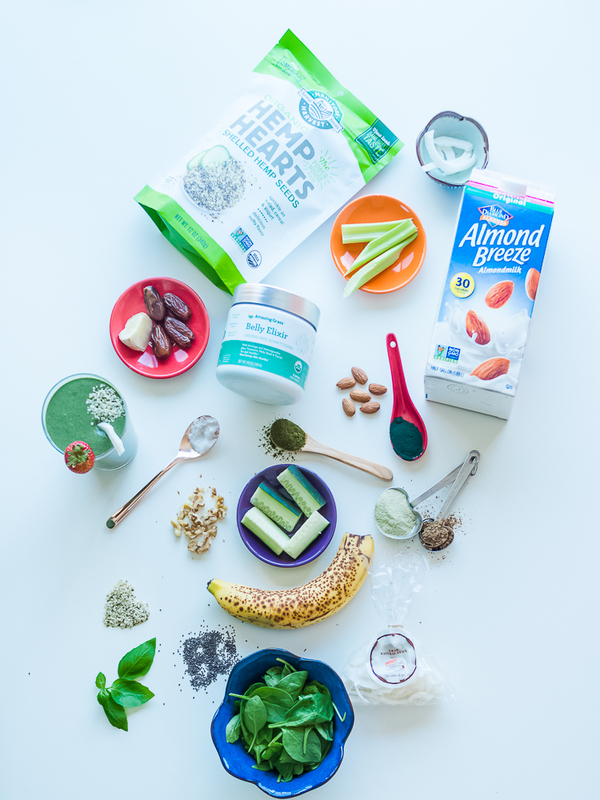 But please do NOT feel overwhelmed looking at the long list of smoothie ingredients below, you can start by using as little as 3 ingredients to make your smoothies and slowly work your way up by including your other favorite (healthy) ingredients. Below is a recipe for my green smoothie. Though the base ingredients usually remain the same across all varieties of smoothies I make, I switch out the main ingredients (with other fruits and/or veggies) based on what I am in the mood for and/or what is in the fridge that day. 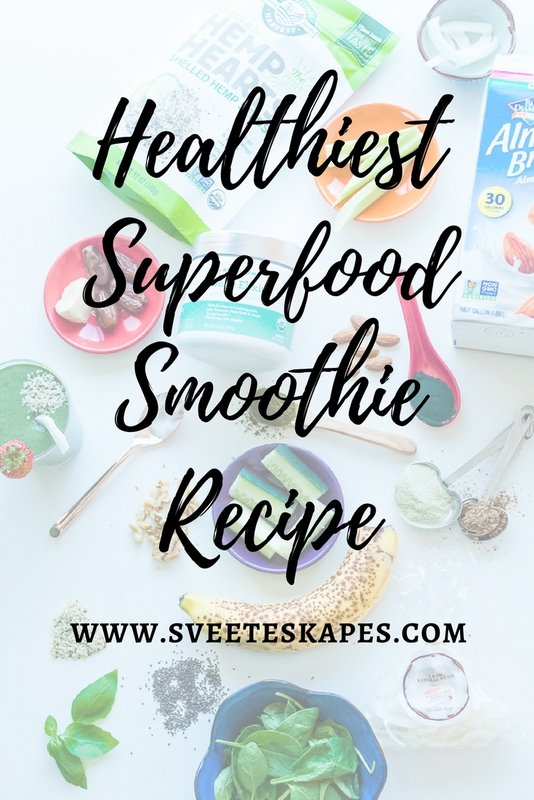 If you are not yet on the smoothie bandwagon it’s never too late to join, but if you are already a huge smoothie fan and have a favorite ingredient(s) that you put in your smoothie, please let me know below as I would love to include it in my next smoothie.